Which type of business entity you choose will impact the way you maintain your records, the expenses that can be deducted and many other tax related implications. At Roland Fink & Co. CPA, a North Hollywood CPA firm, our tax consultants are experienced with structuring all entity types to minimize tax liabilities and ease administration. This is one of the most important decisions you will make for your company and it can have both positive and negative consequences. 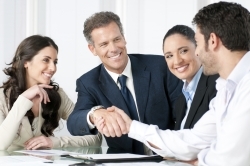 We offer a FREE initial consultation to North Hollywood, CA business owners. Email us or call us at 818-210-5080 and ask for Rollie Fink today.